My biryani series won’t get a meaning without this India’s most popular Hyderabadi Nawab style Veg DUM biryani recipe.Few weeks back i had tasted this vegetable biryani in “Hyderabad biryani house” restaurant in Jayanagar 4th block.They serve with raita and a brinjal gravy.I love that combo.I was thinking to give a try at home but was skeptical about the output.Finally my dream came true with the help of this youtube video.He had explained it so well even an amateur can make it easily.I made very small changes in the actual recipe.I never thought this biryani is so easy to make with a delectable taste and flavor.This is one of the best biryani i have ever tried.Actually when i made this biryani, painting work was going on in my house.In spite of the strong paint smell,the aroma of this biryani was wafting through our house and made us feel hungry.I am not kidding.Just try and see for yourself. You will absolutely love its flavor,taste and give a thumbs up for sure. I did not follow the authentic DUM method by sealing the kadai with wheat flour dough and putting charcoal over it.But still the result was very tasty.Ok,enough of hype,lets see how to make this Hyderabad vegetable biryani at home using DUM method with step by step pictures. Last but not the least,Please don’t forget to leave your feedback in this page if u try this recipe.I will be more happy to know it. Wash and soak the basmati rice for 30 minutes to 1 hour.Wash and peel the skin of potato and carrot. Cut them into small cubes( I chopped like the way served in Hyderabad biryani house).Set aside.Slice onions.Soak Saffron threads in milk. Heat oil and deep fry the onion slices.Fry till golden brown and remove in a plate.Do not burn them,Just fry carefully in medium flame. Remove half of the roasted onions and reserve it for garnishing. In a non-stick kadai,take the chopped veggies.Add cardamom,cinnamon,cloves,ginger-garlic paste,turmeric powder,red chilli powder,Curd,Garam masala powder,Salt,half the fried onions,Lemon juice,Oil in which onions were fried,finely chopped mint + coriander leaves, mix well and check for taste.Let this mixture marinate for 30-45 minutes. Let the rice cook in medium flame for 20 minutes.By now rice will be cooked to 80%.Check whether the rice breaks but it should be firm in shape.Remove the rice alone and keep the water.Do not discard it. Now layer the rice over the marinated masala mixture.Add the reserved rice cooked water all around the rice.I added around 5 tbsp of water.Please note the quantity of water may vary as per the water quantity retained in masala.So make sure u don’t add more water.It will make the rice mushy. Add the saffron soaked milk and finely chopped mint+coriander leaves.Close the kadai with a tight lid or plate so that steam do not escape.Keep a weight over the plate.I kept a bowl with water.U can even place a stone if any. Switch on the flame and turn it to very low.Let the biryani cook in very low flame for 20-25 minutes.No need to open in the middle.But make sure u don’t get burning smell.Your house will be completely covered with an awesome aroma of biryani when its cooked.Now remove the plate and fluff the rice with fork.Garnish with the remaining fried onions and serve hot. Enjoy with raita and brinjal gravy! Add more red chilli powder for extra spicy taste.But we felt 1tsp is enough and it was spicy too. 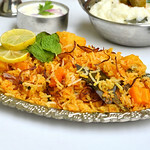 If you want to make this biryani for around 10 people,u can use 3 cups of rice and just increase the spices( use 2.5 times quantity mentioned above)Check for taste and add more chilli powder,garam masala accordingly.I have not tried these measures.I am just giving with a rough calculation as one of my friends suggested me to add this point in all my biryani posts which would be helpful for people making biryani for parties and get together. 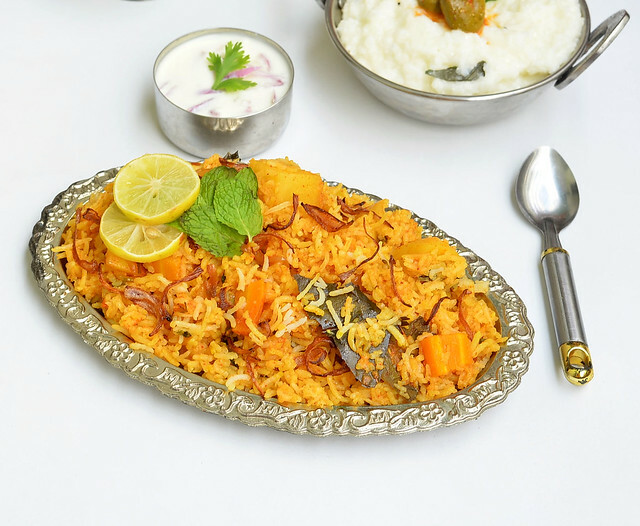 Make this awesome biryani for your guests and family in weekends.Have a delectable meal. Very tempting recipe! Had a question if there is no need to cook or fry the marinated vegetables and they are cooked directly layered with rice in the dum? 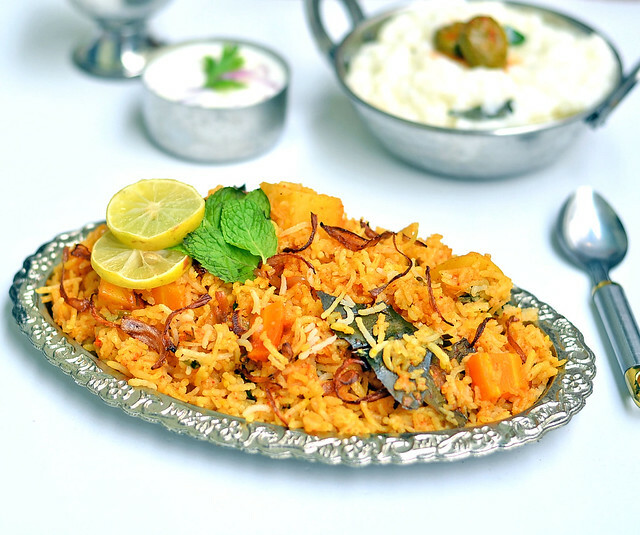 Wow such a flavorful biriyani.. 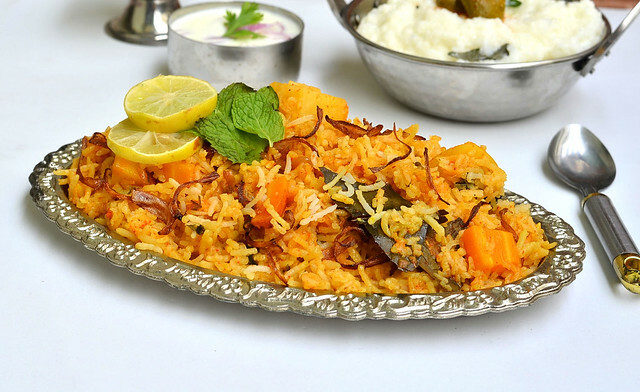 Delicious biryani! Awesome work Chitra.